Stony corals (class Anthozoa) produce proteins that fluoresce in the presence of ultraviolet (UV) radiation. The function of these proteins is currently unknown, though it has been speculated that they may help protect corals and their zooxanthellae from superoxide radicals and the abundant UV in shallow tropical waters [1-3]. In addition to their fluorescent ability, these proteins tend to be small (approximately 238 amino acids), bright, and temperature- and pH-resistant. These qualities make them desirable for use in a number of laboratory applications, such as fluorescent tagging to observe protein dynamics [4,5]. A drawback of using fluorescent proteins is that they can often be visualized only once before they are photobleached. To address this problem, Ryoko Ando et al. created a mutant, named Dronpa*, of a photoswitchable fluorescent protein from the Pectiniidae family of coral. Dronpa's fluorescence results from a three-residue structure called a chromophore, shown here in the on state . The chromophore fluoresces green when exposed to 503 nm light and is "turned off" by exposure to 488 nm light. Dronpa has two unique and useful characteristics. First, the photoswitching process is reversible; exposing off-state Dronpa to 405 nm light converts it back to its fluorescent (on-state) form [6,7]. The second useful quality is that each protein can undergo photoswitching over 100 times without photobleaching, a quality which has many potential experimental applications . Since the creation of Dronpa in 2004, numerous groups have mutated the protein to make it faster, more durable, and multicolored [8-10]. In this tutorial, we first introduce the wild type protein, 22G, and explore the mutations made to it in order to create Dronpa. Next, we explain the mechanism by which photoswitching occurs, examining differences in the on- and off-state Dronpa structures. Lastly, we highlight a particularly useful Dronpa mutant, named pcDronpa, that has green-to-red photoconversion ability. In an attempt to clarify the different mutants from the wild type protein included in this tutorial, each mutant is represented by a different color scheme (see table below). *After the Japanese word dron referring to ninjas disappearing and PA, for photoactivation. The wild type protein that Ando et al. originally purified from coral, "22G," formed an oligomer with a molecular weight of 102 kDa. This was 3.5 times greater than the 29.2 kDa molecular weight expected from the protein's primary structure . Ando et al. therefore created a monomeric mutant ("22Gm3" which they renamed Dronpa) with a molecular weight of 28.8 kDa. This monomer forms a tetrameric complex in vitro, as displayed in the "Show Wild Type Protein (22G)" button above. To make Dronpa, Ando et al. introduced six mutations to 22G: Ile102-Asn, Phe114-Tyr, Leu162-Ser, Arg194-His, Asn205-Ser, and Gly218-Glu [4,10]. These mutations break down the quaternary structure of the tetrameric wild type protein to yield the monomeric mutant, while also avoiding the chromophore to preserve the protein's fluorescence. Quaternary structure stabilization in 22G is demonstrated by interactions between Ile102+Ile102 and between Gly218 and residues including Pro141  . It therefore follows that elimination of Ile102 and Gly218 contributes to tetramer dissociation. In the on-state, Dronpa crystals consist of four identical beta-barrel protomers, or beta-cans, that each contain an interior chromophore . The secondary structure of Dronpa is similar to that of other fluorescent proteins. Each beta-barrel consists of 224 amino acids, comprising numerous elements. Eleven beta-sheets of differing lengths shield the chromophore from external interactions. One of these, beta7, is divided into two beta-sheets (beta7a and beta7b) by two amino acids. In addition to the beta-sheets, each subunit of Dronpa has a chromophore, two short alpha helices between residues 54-59 and 77-82 that reach into the beta-can to support the chromophore, and numerous linkers that connect all of these elements. The chromophore tripeptide Cys62-Tyr63-Gly64 (CYG) confers fluorescent function to the protein and sits inside a hydrophobic pocket made up of Gln38, Met40, Thr58, Ile195, Leu209, and Glu211. CYG is held in its cis- conformation in the beta-can by covalent peptide bonds with Phe61 and Asn65. Multiple hydrogen bonds and van der Waals interactions further stabilize the chromophore moiety. Unlike most fluorescent proteins, the Dronpa chromophore is attached from both ends to the beta-can via co-axial alpha helices. Photoswitchability back and forth from the fluorescent state to the dark state is dictated by chromophore conformation. When the chromophore tripeptide absorbs light of wavelength 488nm, it transitions from the cis- (fluorescent, or "on state") conformation to the trans- ("off state") conformation (see image below) [6,7]. Upon absorption of 405nm light, the chromophore switches back to the cis- conformation, effectively restoring the fluorescence of the protein . 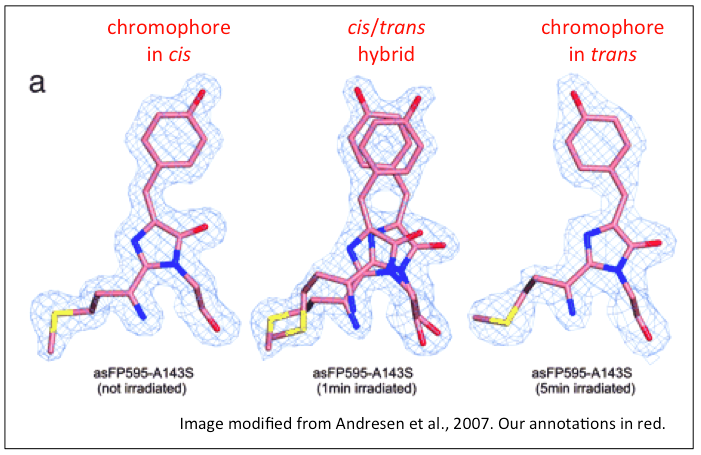 The off-state Dronpa protein is nearly identical to the green-fluorescent state, with the exception of changes in amino acid residues Arg-66, Ser-142, Val-157, and His-193, which accommodate the transition from the cis- conformation of the chromophore to the trans- conformation. Slight rotation of these four residues results in the rearrangement of the p-hydroxyphenyl ring in the chromophore. Movement of Ser-142 breaks a critical hydrogen bond to the p-hydroxyphenyl ring, slightly destabilizing the chromophore. Destabilization of the chromophore in the dark state contributes to its inability to fluoresce. One mutant of important experimental significance that has been created from Dronpa is a green-red photoconvertible protein, named pcDronpa. Photoconvertibility of a reporter protein like Dronpa affords research groups the ability to use multimodal imaging, using the two different fluorescent colors to obtain high resolution images that show precise localization and activity of a target protein. Multimodal imaging is being adapted to many existing technologies, such at PET-CT scanners . The rapid photoswitching mutant can cut down experiment duration, making it an appealing alternative to the original Dronpa protein. PcDronpa was created by making four mutations to the original Dronpa mutant: Cys62-His, Asn94-Ser, Asn102-Ile, and Glu218-Gly. The Cys62-His mutation affects the chromophore itself, contributing to the ability of pcDronpa to photoconvert. Note that the mutations to amino acids 102 and 218 that enabled the original Dronpa mutant to exist as a monomer have been reversed in pcDronpa, permitting it to take on its tetrameric form . Similarly to the original Dronpa mutant, this protein is switched to the dark state by absorption of 488 nm light and fluoresces green by absorption of 405 nm light. To convert to the red state, high intensities of 405 nm light are required. Unlike the green state, the red state is unable to photoswitch from the on- to the off-state. Rather, conversion to the red state cleaves the protein backbone, rendering it unable to switch to an off state. The slightly non-planar characteristic of the chromophore in the red state protein is the most notable physical difference between the red and green protein structures and is likely caused by a hydrophobic interaction between the imidizole group (CH2NCH) of the chromophore and Met40 .